The request for proposal (RFP) is a key element when evaluating benefit administration providers. RFP responses can provide a look under the hood of a potential partner’s solution and services, but in order to get the most value from the RFP process, it’s crucial that your questionnaire goes beyond a simple “check-the-box” exercise. 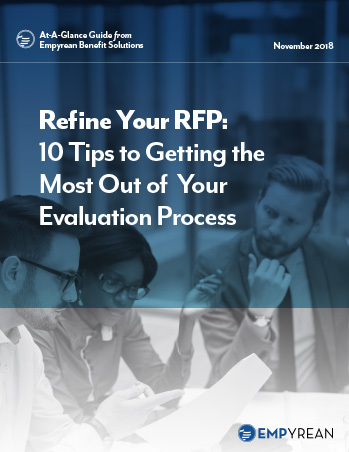 In Empyrean’s latest At-A-Glance Guide, you’ll learn the top 10 tips for crafting an effective RFP and managing a productive evaluation process. The right structure and proactive planning will ensure your time and effort deliver the best return on your investment for years to come. Here are five tips from the guide. Before evaluating any type of solution, you must understand what you’re looking to solve. The first step of a successful RFP is a thoughtful internal evaluation of your current and future needs. Before drafting your RFP, gather stakeholders to openly discuss the issues and the goals you want to address with a new benefits administration solution. You will also want to ensure you have a complete list of all the vendors, number of files, and file transmission schedules that a potential partner will need to manage. Clearly state these details in the introduction to your RFP. Get a clear sense from your entire team of your current needs and desired future-state, and have defined expectations of how your chosen provider will help make this change a reality. Understanding and articulating your needs from the start will allow you to perform a more objective and concrete evaluation of providers as you proceed through the RFP process. A benefits administration provider is a choice that will impact the success of your benefits strategy and employees and participants for years to come. Rushing the decision or boxing yourself into a shortened timeline with an emergency implementation is not advised. Establish your target dates well in advance for the RFP process, finalist meetings and selection, kick-off and implementation, Go-Live, and Annual Enrollment (AE) on your new system. Schedule target dates around your team’s requirements and realistic availability. Your timeline may vary depending on internal and external factors, your specific needs, and your schedule. At a minimum, allow four to five weeks between the release of your RFP and the vendor submission deadline. A thorough RFP should not be a send-it-and-forget-it process. Allow for some measured dialogue with your recipients. Providing enough time for you to receive and respond to vendors’ follow-up and clarification questions will ensure you gain the most clear and relevant information from RFP respondents. In short, you will get better quality responses. If you want to gather preliminary information from a large number of providers, or are not yet sure which factors will be the most important to your business, consider releasing a Request for Information (RFI) before moving on to an RFP. An RFI will give you top-level perspective into vendor possibilities, help clarify your most important evaluation factors, and narrow down your list of RFP recipients for more a manageable and productive process at the RFP stage. When using a sourcing advisor or consultant, be sure to vet their services as you would any other vendor or partner. Your advisor should be an expert advocate for your success, and ensure that your RFP reflects the latest issues and practices impacting employee benefits, employer compliance, enterprise technology, and more. Benefits administration technology providers are not one-size-fits-all, nor do you want a generalized enterprise solution that is not specific to you. A trusted advisor will bring rich industry perspective to individualize the RFP to your needs. They will check that your RFP addresses up-to-date and relevant topics that enable you to select your best-fitting, long-term partner. Whether you are working with a sourcing advisor or handling the RFP process in-house, the purpose of your RFP is the same: You want to determine the best benefits administration partner for your business. Unfortunately, many RFPs consist of boilerplate yes-or-no questions and generic language that fail to address clients’ specific requirements, concerns, and goals. Without a proper-fitting RFP, the resulting questionnaire will be too broad to gather meaningful responses – leaving your team to find subtleties among similar answers from multiple providers. This increases the risk of selecting an ill-fitting vendor. During the preliminary internal meeting with your stakeholders (see Tip 1), be sure to clearly define the requirements, processes, and partners that are unique to your benefits strategy and program. Work with your sourcing advisor and/or team to develop open-ended questions that address your specific needs and invite truly informative responses from respondents. For more actionable insights on building a successful benefits administration RFP, download Empyrean’s new At-A-Glance Guide today. With these RFP tips top-of-mind, you will be well positioned to direct informative and productive partner evaluations, help minimize your risks, and empower your team to make the best partner choice for your business.